The St. Johns County School District Elementary Science Technology Engineering and Mathematics (STEM) Fair was held at Palencia Elementary School on Saturday, May 5 from 8-11 a.m. The purpose of this event is to encourage and celebrate student interest in STEM, with the primary goal to promote student use of STEM to solve real-world problems. Student representation will be decided at the school level. Teachers, parents, administrators, and community members are welcome to attend. The 63rd annual State Science and Engineering Fair was held in Lakeland March 27-29. Local judges selected 13 projects from among 95 displayed at the St. Johns County Science and Engineering Fair held February 7 to participate in the state fair. Five middle and 8 high school students from our county competed with students from 40 other fairs across the state. In addition to the competition and comradery, students enjoyed a trip to Busch Gardens and a bowling excursion. Emma Kee, Lourdes McKay, Aditya Singh, Madison Toonder, Landon McIntosh, and Alan Michael received special awards for their research. In the categorical awards, Recognition awards were received by Alan Michael, Emma Kee, Courtney Krider, Landon McIntosh and Lourdes McKay. Yara Chehade received Honorable Mention. Madison Toonder and Aditya Singh received 4th place awards in their categories and Yash Singh received a 3rd place award for his research. Emily Revuelta and Timothy Kellett each received 2nd place awards. Two students, Yara Chehade, and Aditya Singh, both from Nease High School, will move on to the International Science and Engineering Fair in Pittsburgh, Pennsylvania during the week of May 14. Marna Fox, science fair director, will accompany the students as they share their research and compete with students from around the world. Laura Wynn, Program Specialist for Secondary Social Studies, presented Vietnam War Instruction happening in our schools to the Veterans Council of St. Johns County at their March 29 meeting. Over 80 local veterans as well as other county residents attended. The presentation offered insight regarding state and local curricular requirements, standardized testing, and instructional resources and strategies used by St. Johns teachers when addressing this important topic. Mrs. Wynn also shared that the district hosted Vietnam veteran guest speakers in secondary classrooms several times throughout the past school year. Over 1,400 students benefited from this experience and we look forward to expanding these programs into more classrooms in the future. The St. Johns County Spelling Bee was held January 17 at First Coast Technical College. Students in grades fifth through eighth from 33 public and private schools participated. The winner was Carly Miller, an eighth-grader from Switzerland Point Middle School and runner-up was Jackson Willis, an eighth-grader from Liberty Pines Academy. Both will advance to the regional bee in Jacksonville Saturday, March 9. The pronouncer for the event was Linda Villadoniga, retired SJCSD teacher. Judges were Cheryl Freeman and Jay DiMartino, both SJCSD employees and Sandy Waldies, community representative. The Character Cup, a student-centered event highlighting physical education, links academics and character education through athletic competition. Two hundred student-athletes representing 20 elementary schools participated in the 2017 event and this year’s event looks to be even bigger and better. The 2018 Character Cup will take place March 21 at St. Augustine High School. Parents, teachers, administrators, school mascots and community members are strongly encouraged to come out in support of these hard-working students. The Character Cup Trophy will once again be awarded to the winning team for display at their elementary school during the 2018-2019 school year. 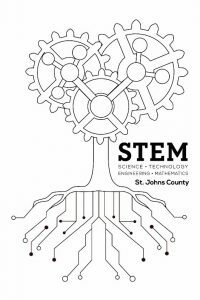 The St. Johns County Elementary Science Technology Engineering and Mathematics (STEM) Fair will be held at Palencia Elementary School Saturday, May 5 from 8 – 11 a.m. The purpose of this event is to encourage and celebrate student interest in STEM, and to use these to help solve real-world problems. Teachers, parents, administrators, and community members are welcome to attend. The St Johns County Science Fair was February 7at First Coast Technical College (FCTC). The awards ceremony was held February 8 at FCTC. The American Association of University Women partnered with St. Johns County School District to offer our first STEM (Science, Technology, Engineering and Mathematics) Spark Event on Saturday, October 21, 2017. More than 80 seventh and eighth grade girls from St. Johns County attended the STEM Spark Day at Sebastian Middle School. The purpose of STEM Spark Day was to “spark” an interest and broaden the girls’ understanding of STEM fields and careers. Students had an opportunity to learn from and ask questions of these STEM careers women in small group sessions and a panel of five of the women who talked about how they chose their field, the path they took to get to their current job and hear advice on how to learn more about opportunities available in STEM fields. Parents also attended the panel discussion with their daughters and received information about preparing for high school from SJCSD Guidance Specialists. According to student feedback, the best part of the day was the “mingle session” where students and parents could continue talking with the women informally. St. Johns County School District receives funds from the state to assist in funding instructional literacy coaches. The district provides additional funds so that every school has an instructional coach. In order to receive the state funds, the district submits our Comprehensive Reading Plan, which is available online for any district. The district conducts a visit to each school to confirm that the Comprehensive Reading Plan is being followed with fidelity – that appropriate and effective reading instruction is occurring at each school. The directors for elementary and secondary instructional services visit classrooms at each school for this purpose during the second quarter. Feedback from the fidelity check is provided to the school and can be used to improve instruction in English/Language arts. Congratulations to Bartram Trail, Creekside, Ponte Vedra and St. Augustine high schools’ bands, winter guard and band directors for achieving superior (highest) rating at the recent Florida Bandmasters Association (FBA) District 21 marching band Music Performance Assessments, hosted by Bartram Trail. The elaborate marching programs performed during halftime at football games culminate in the FBA district competitions, where they compete with bands from Clay, Putnam and Flagler counties for ratings in marching, music, general effect and auxiliary (Winter Guard) categories.